Teacher Gregory Irwin receives the Teachers of Hope and Promise Award. He is pictured here with Dr. Jennifer Rukstad, principal, and members of the Worley Street Roundtable. Photo by Bailey Stover. 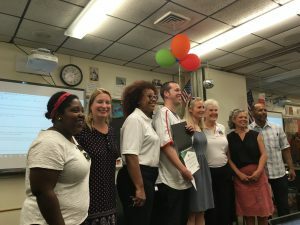 With a “Everybody stop what you’re doing,” Dr. Jennifer Rukstad, principal, entered English teacher Gregory Irwin’s room followed by members of the Worley Street Roundtable,holding a certificate balloons and a check for $500. Their arrival came as a surprise in the midst of his class’ focused review for the Advanced Placement World History exam, which was less than a week away on Thursday, May 10. The Worley Street Roundtable is a local organization that works to fight implicit bias in school settings as well as to make education a student, parent and community effort. What started as weekly meetings at Worley Street Manor is now an organization that has partnered with Columbia Public Schools and local universities. The award came as a shock to Irwin. He had had prior knowledge of the award, but his nomination was pure serendipity. Sophomore Audrey Snyder was looking for an opportunity to bolster her college applications when she came upon a form prompting her to nominate a teacher of Hope and Promise. She figured she should pursue her mistake to see where it would take her. For Irwin, supporting students is all in a day’s work. Rather than claim the credit for his award, he spoke of how other teachers that deserved the recognition and how important his students are to him.